Archie recently took part in the Toyota dream car competition where he had to design his own dream car. Archie designed a Minecraft dragon car and was awarded a bronze award in the 8-11 age group, despite being one of the youngest competitors in this age group! He has now been entered into the world competition for Toyota for his artwork, where if successful he could win a trip to Japan. 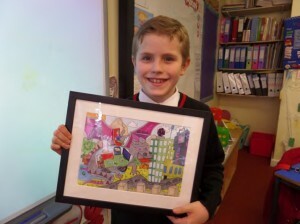 Best of luck to Archie and watch out for this budding artist in the future!